The following guide will help you to reset Android on the Motorola RAZR D1. The following two official processes allow your Motorola RAZR D1 back to its factory settings. 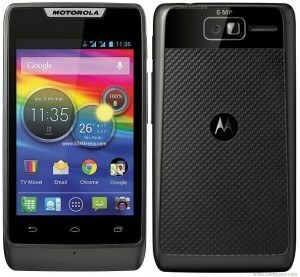 These reset Android procedures will deliver the added benefit of making your Motorola RAZR D1 rid of any active pattern lock (Second procedure) and give you back the original full speed and no pop up errors behavior, as if your Motorola RAZR D1 has been just bought (both procedures will achieve it). Before you continue with this reset Android tutorial, we recommend you charge your Motorola RAZR D1 up to 80% of it’s total battery, just so you can avoid unexpected outages. Usually, once the Motorola RAZR D1 restart see the welcome screen where you can adjust its factory settings. Navigate with the VOLUME keys on the maintenance menu that just appeared and select the FACTORY option. Press the POWER button to continue with the process. When a droid is displayed on your screeen, briefly press the VOLUME UP button, if all goes well you’ll see the emergency recovery menu appear. Use the VOLUME buttons to move into “Wipe data / Factory reset” and confirm with the POWER button. On the next screen, select and confirm “Yes – Delete all user data” option with the VOLUME and POWER buttons, just as before. If everything went OK, you just reset Android in your Motorola RAZR D1!